In order to help celebrate the 20th Anniversary of Psytronik Software, Jason ‘Kenz’ Mackenzie has put together a rather special and Limited Edition CD set that combines the music from the company’s releases between 1993 and 2013 with episodes from the One Man & His Mic podcast. 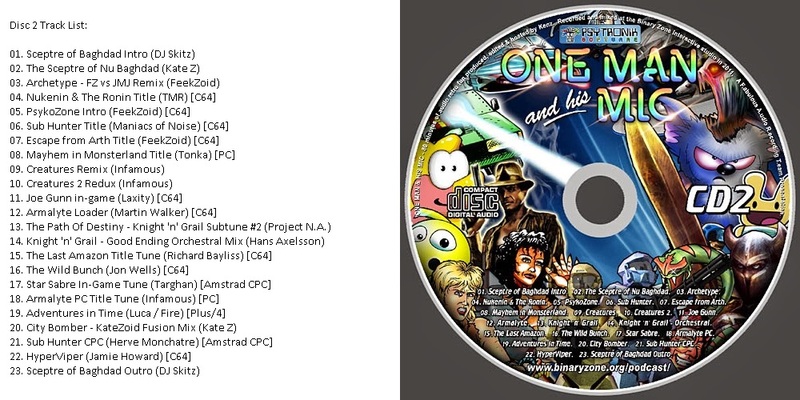 The first CD in the set features various soundtracks from Psytronik releases while the second CD mixes excerpts from the podcast with a different selection of soundtracks. The podcast entries give information about the releases. CD 1 runs for 80 minutes. The music included has original tracks from various releases that have been remastered for optimal quality as well as brand new recordings of other tracks. The full track list can be found below. 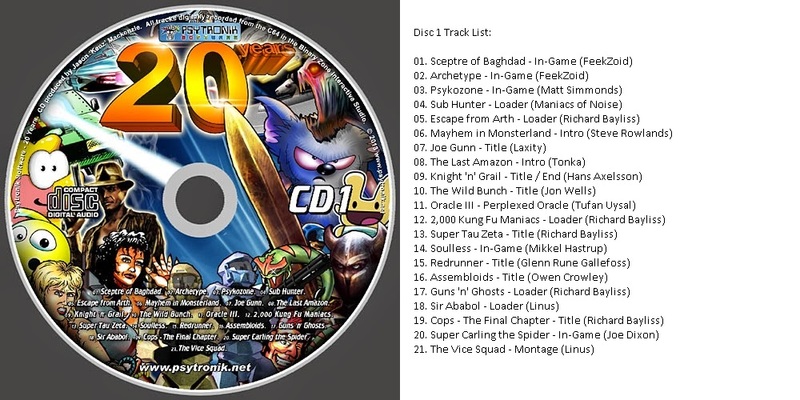 CD 2 also runs for 80 minutes, which includes the podcast entries as well as music remixes, tunes inspired by Psytronik games, and music recorded from various computer systems. This 20th Anniversary CD set is limited to 250 copies, so anyone wanting it should immediately go Binary Zone Retro Store at the link above. This is easy. I love it. This CD set is excellently done. The CD’s themselves are beautifully packaged and each CD has simply amazing artwork. Of course, what is a nice looking CD without great music? Well, nothing to worry as these CD’s have excellent music for you to enjoy from an assortment of Psytronik soundtracks. I’m actually listening to the music from the first CD as I write this review. As much as I enjoyed the first CD, the second CD is really cool to listen to because you get the backstory for the releases from Psytronik followed by the musical arrangements. It is clear all the sountracks and audio segments have been remastered so you can enjoy a pristine sonic experience. This is one fantastic CD set. If you enjoy video game music, you are sure to enjoy this collection. One of the great things about the set is that you get different tunes in each CD so there is plenty of music to be enjoyed and you can get them without breaking the bank. Remember, though, these are limited to 250 copies so don’t take too long to get your copy.